Geshe Lobsang Tenzin Negi, Ph.D, (legal name Satya Dev Negi) is the co-founder and Director of the Emory-Tibet Partnership, a multi-dimensional initiative founded in 1998 to bring together the foremost contributions of the Western scholastic tradition and the Tibetan Buddhist sciencees of mind and healing, and a Professor of Practice in Emory University's Department of Religion. He is also the founder and spiritual director of Drepung Loseling Monastery, Inc., in Atlanta, GA. In this capacity, he serves as Co-Director of both the Emory-Tibet Science Initiative and the Emory Collaborative for Contemplative Studies. He also developed Cognitively-Based Compassion Training (CBCT), a compassion meditation program that is currently utilized in a number of research studies, including an NIH-funded study examining the efficacy of compassion meditation on the experience of depression. Geshe Lobsang, a former monk, was born in Kinnaur, a small Himalayan kingdom adjoining Tibet. He began his monastic training at the Institute of Buddhist Dialectics and continued his education at Drepung Loseling Monastery in south India, where he received his Geshe Lharampa degree, the highest academic degree granted in the Tibetan Buddhist tradition, in 1994. 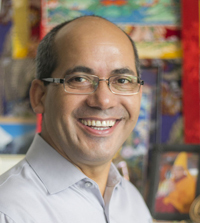 Dr. Negi completed his Ph.D. at Emory in 1999; his interdisciplinary dissertation centered on traditional Buddhist and contemporary Western approaches to emotions and their impact on wellness.